There's an extra table which gives you the values of P(Z>z) where z is 0.3 or 0.2 .... and so you would have lost a mark for accuracy but if you used the other table you would have not got the simultaneous equations accuracy mark but the final answer rounded to 3dp should be the same. For the normal distribution I got to 4 dp -0.5422 and 0.8416. 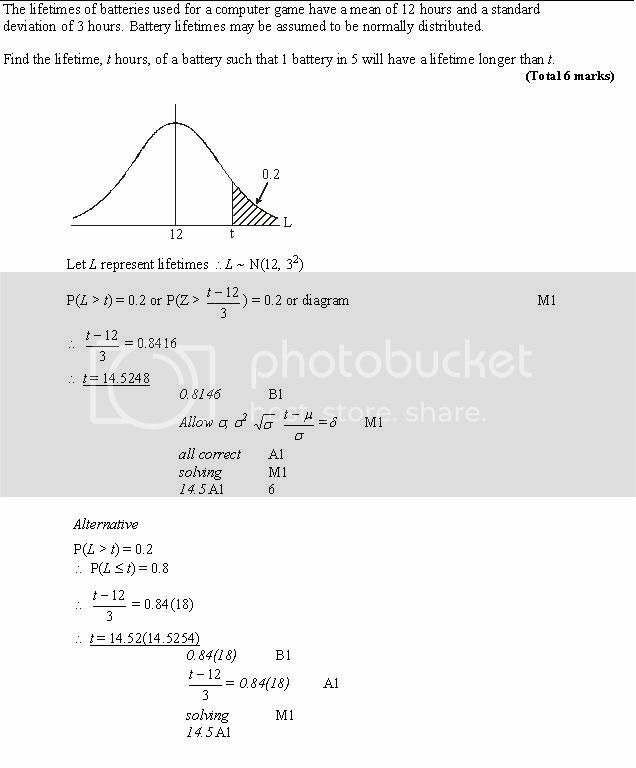 So For Normal Distrbution Question --- Can You Use The Percentage Points At The Back 0.3 And .02 ??? I know this my sound harsh but edexcel expects you to use that table, in one of their markscheme which had values like 0.3 they used it and even put in the margin: Only accept 0.5244 for A1 or something. thats really unfair if they do... coz our teacher never told us about that whilst doing past papers and stuff. we just refered to orignal tables which has 2dp. Damn, all those 10 weeks of revision for S1 gone down the drain. See how they gave a mark for the perfect more accurate answer? ok... now i just wanna punch the wall. Look at my scheme, they accept both. And anyway, it was 6 marks for formulating two equations and solving them. Thats a lot to do and a lot to give marks for. They're arent going to give silly B1 marks out in this question. Don't worry. The question you showed was one where there were 4 marks for one simple thing. Here there were 6 marks for doing this twice and solving an equation. They just arent going to give marks out for small things like that. Hmmm another one, interesting. Especially how they give a B1 just for the value: a 9 marker that one! At most, they maybe, might give one B mark. Can anyone remember the individual parts to the integration question? c) Give the length of....? e) Find the length of...?